The distinguished courtier-poet Sir Thomas Wyatt grew up at Allington, an estate nearly adjoining the Boleyn family's Hever Castle. Wyatt was estranged from his own wife, and unverifiable romantic legends about Anne and him abound, particularly in the writings of Wyatt's grandson. There is conjecture that some of the most yearning poetry attributed to Wyatt was inspired by their relationship and that it is Anne whom he describes in the sonnet Whoso List to Hunt, as unobtainable, headstrong, and belonging to the King: "noli me tangere for Caesar's I am/And wild for to hold though I seem tame". 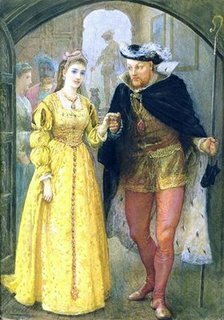 In 1526, King Henry became enamoured with her and began his pursuit. Anne resisted the King's attempts to seduce her, refusing to become his mistress, often leaving court for the seclusion of Hever Castle. Within a year, he proposed marriage to her, and she accepted. Both assumed an annulment could be obtained within a matter of months. There is no evidence to suggest that they engaged in a sexual relationship until very shortly before their marriage if at all; in fact, Henry's love letters to Anne seem to prove that their love affair remained unconsummated for much of their seven year courtship. Suggestions that they were sexually active before this time are now largely regarded as part of the defamation campaign orchestrated to destroy Anne's reputation after her death. Anne Boleyn was not in love with Henry VIII. She had seen how her sister Mary had given into the King and been quickly discarded. Anne had no intention of making this mistake. She was adamant that she would only give herself to the King if they were married - and how was this possible as he already had Katharine of Aragon as a wife?